Description: Audubon, a French-American ornithologist, hunter, and artist, developed his own methods for drawing birds. First, he killed them using fine shot. He then used wires to prop them into a natural position, unlike the common method of many ornithologists, who prepared and stuffed the specimens into a rigid pose. When working on a major specimen like an eagle, he would spend up to four 15-hour days, preparing, studying, and drawing it. His paintings of birds are set true-to-life in their natural habitat. He often portrayed them as if caught in motion, especially feeding or hunting. This was in stark contrast to the stiff representations of birds by his contemporaries, such as Alexander Wilson. 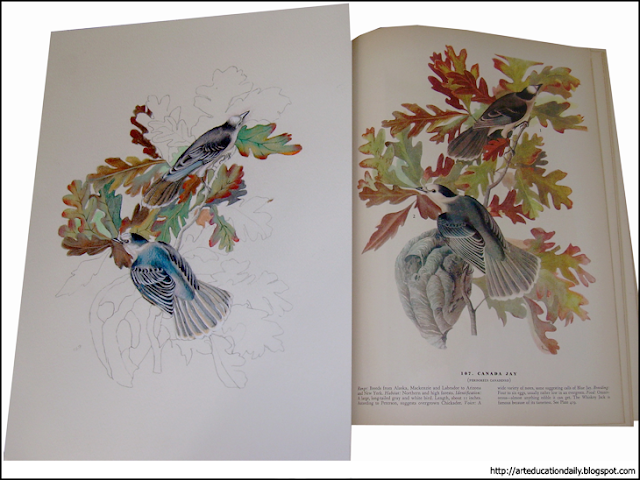 Audubon based his paintings on his extensive field observations. Strand I: Product/Performance – Select and apply two-dimensional media, techniques, and processes to communicate ideas and solve challenging visual art problems for all high school grades. Concept B. Scientific inquiry relies upon gathering evidence from qualitative and quantitative observations. - Determine the appropriate tools and techniques to collect, analyze and interpret data. Students will study the watercolors and drawings of the famous orinthologist John James Audubon by observing a slide presentation, reading the attachment about him following this lesson plan and visiting web sites. Students will copy prototypes of Audubon’s work and develop their skills in watercolors and colored pencils. Students will research the life of Audubon through a selection of provided materials. Students will select a prototype of James Audubon. Make tracings or stencils to transfer the prototype to fine watercolor paper and paint. The teacher will show a slide presentation of John James Audubon’s life. The teacher will assign to each student a prototype to work from. The teacher will demonstrate methods of watercolor and drawing to the class during the sessions. Phase 4: Check for understanding and provide feedback – A standardized rubric will be used to analyze and critique each individual student’s artwork. Phase 5: Provide extended practice and transfer – Students will be encouraged to create even more projects at home. Materials used during class and the research conducted on their own computers at home may be duplicated in their own home environment at very little expense.